Paramount has begun to distribute the first production photos from JJ Abrams‘ Star Trek around the web. Above is a first look at the crew on the Bridge of the USS Enterprise from MTV. Lindelof says that Kirk’s Black shirt is the Captain uniform, and that the red shirt crew member in the background is of no importance (ie Uhura probably replaces her after she dies early on). The bridge looks extremely cool, I can;t wait to see more of it. UGO has the first cast photo of the Enterprise crew (From left to right: Anton Yelchin as Chekov, Chris Pine as James T. Kirk, Simon Pegg as Lt. Montgomery Scott, Karl Urban as Dr. McCoy, John Cho as Sulu and Zoe Saldana as Uhura). 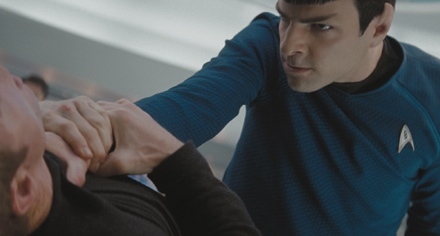 Below is AICN’s photo of Zachary Quinto as Spock (could that be the Vulcan Death Grip? And if so, who is at the other end of it?). 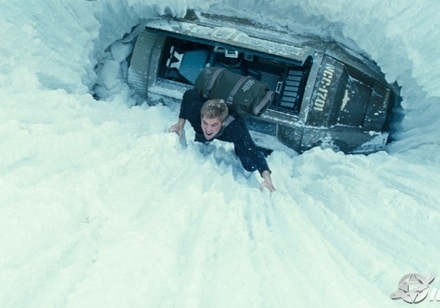 IGN has a photo of Kirk, who appears to have landed in an ice crater on what we assume is an Arctic-like planet. 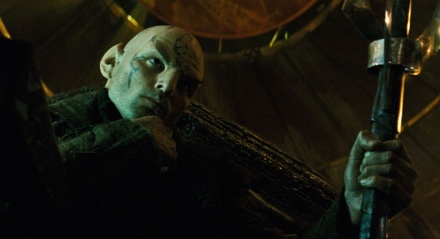 Below is Eric Bana as the film’s Romulan villain Nero on the bridge of his unnamed rouge vessel from JoBlo. TrekMovie has a first look at the USS Kelvin, a Federation starship from the generation before the Enterprise. The ship is commanded by Captain Robau (Faran Tahir) with George Kirk (Chris Hemsworth) as first officer. Looks like the ship is under attack and in pretty bad shape.